For all the years that Dr. Bladh has been doing Sports Vision Training, we have wanted to have a product that we can use to see from the athlete's perspective; Google Glass has filled that void. Before Glass we had to tape a video camera on our athlete's head while they did drills and... let's just say it wasn't working out. We're very excited to announce that we just purchased a pair of Google Glass to use for our athletes so we can see the tendencies they have while doing drills, performing on the field, etc. This technology will give us real world Point-of-View (POV) so we can not only show the athlete what they might be doing wrong, but also use it in other types of training to help others avoid mistakes to make them more efficient. We'll release more videos as they come available with our athletes and their drills, but for now we just wanted to let our patient base and athletes know it's here and we can't wait to use it on them. We head to Spring Training in a couple of weeks and can't wait to have our guys use them before the season starts! 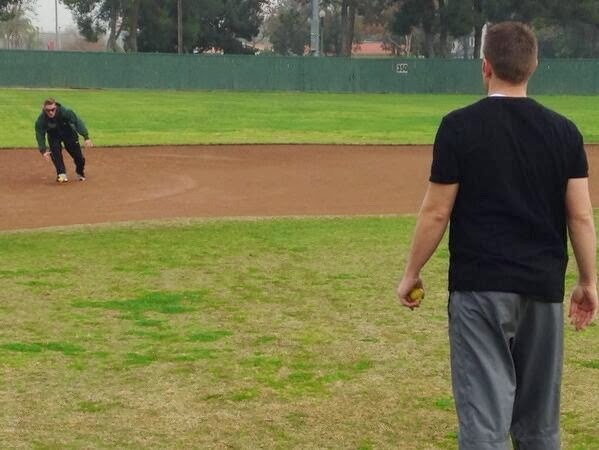 A big thank you to @socalsteve9 for the picture above while we train our athlete Daniel Robertson from the A's.